Could Boston Bike Share Increase Brain Injury? Bicycle riding is a popular way to get around Boston and many major metropolitan areas in the United States and bicycle share programs have been making it easier for more people than ever to commute via bike. Unfortunately, recent studies suggest that in cities with bike share programs, there is dramatic increase in the number of people who experience brain injury. Brain injury can have devastating and lasting effects and can be very costly to treat. Unfortunately, bicycle accidents leading to brain injury frequently occur because drivers fail to share the road in a safe way with bicycle riders. When a driver is to blame for causing a brain injury, he becomes responsible for compensating the victim or his family members for the economic and non-financial costs of the injury. An experienced Boston brain injury lawyer should be consulted to provide assistance to those who wish to take legal action after a bicycle accident. According to a study published in the American Journal of Public Health on public bike share programs, making more bicycles available for rent resulted in more people suffering head injuries. In fact, the proportion of bicycle-related head injuries leading to admission to a trauma center increased by as much as 14 percent. Trauma center data was analyzed from five different cities with bike shares as well as from five comparison cities. Researchers used logistic regression models to compare the odds of admission to a trauma center for a bicycle related accident that involved head injury. The odds of head injuries were assessed from 24 months prior to implementing the bike share program and 12 months after. In cities with a bike share, the proportion of head injuries that occurred in bicycle-related accidents increased from 42.3 percent prior to the bike share program being implemented to 50.1 percent after. In comparison cities, the risk of head injury remained unchanged. The researchers believe that the likely cause of the increase in head injuries in cities with bike sharing programs was that the rental programs only made the bikes available and did not include helmets with the rental. The researchers suggested that helmets should become part of the programs and should be a factor as the programs were being designed and implemented rather than considered as an afterthought. While helmet use can help to prevent brain injury when a bike accident occurs, it is far better to prevent the accident from happening in the first place. 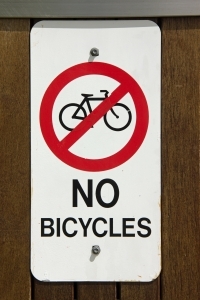 When bike shares are implemented, drivers need to be educated about the rights of bicycle riders on the road and about proper bike safety procedures. If drivers respect the rights of bicyclists, fewer accidents should happen and head injuries and other types of harm including spinal cord injuries and fatalities can also be prevented. Bicycle riders should still be entitled to compensation after an accident, regardless of whether they had a helmet on or not. Those hurt or family members of loved ones killed in bike crashes should speak with an experienced attorney for help.